As I read the article on Ad Age titled "What if the real 'Winner' of SXSW was AmEx? ", I felt a strange sense of loss. Big brands, with big budgets, were the focal point of a number of news stories covering SXSW. I couldn't help but wonder "what happened to the Indie Music and Indie Startup scene?". SXSW, it seems, may have sold out and, if it hasn't, is losing touch with it's roots. If you read the article you'll see it says AmEx "stole the attention away from the thousands of startups represented there", but shouldn't that be easy to do when you can afford to hire Jay Z, rent the venue, and market that info? 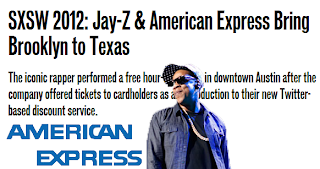 The real question should be how much did AmEx spend to buy the buzz and can startups compete with the likes of AmEx and Nike pouring huge bucks into #SXSW. I do think AmEx did it right, as pointed out in the article, but they had an unfair example that startups are unlikely to match. This of it this way: If Twitter or Foursquare had launched during AmEx's high priced media blitz, would they have won the show instead? Would have they received the same attention? Maybe Gowalla's story might be a bit different. From a marketer's standpoint, the culture and flavor of SXSW may be shifting dramatically away from independent music, art, culture, and tech to a show that has sold it's soul to big budget branding. That may forever change what can be introduced and marketed there, the tactics, and more importantly, the cost to play.